We know that Anakin was very-badly injured to the point of near death, burned from head to toe and for simple survival he wears his iconic suit. My question is, obviously the capability to take someone so severely injured and provide a way to stabilize their body and provide some form of life existed, else the entire repair sequence of Anakin into "Darth Vader", wouldn't have been possible. So, within the Star Wars universe, are there any other characters who suffered some sad fate but was medically repaired similar to Vader? Obviously, Anakin had artificial limbs, a breathing apparatus and a head mask. I'm not sure what the mask is specifically for, but that's honestly what I'm most curious about, is someone else traveling along the galaxy that looks much like Vader? 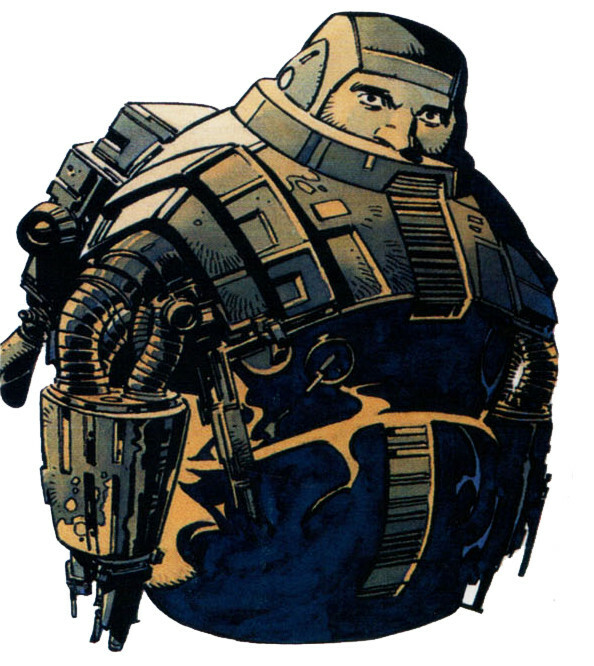 There are several examples of characters with particularly extensive cybernetic modification, though none that I would consider notably close in design to Darth Vader in canon continuity. General Grievous was a cyborg who had such extensive modification that his organic parts consisted of little more than a brain, eyes and a few internal organs. Mercenaries from the Guavian Death Gang that confronted Han Solo during the events of The Force Awakens were cybernetically enhanced with artificial organs and armor similar to Vader's, though they were the result of voluntary augmentation rather than necessitated by injury. Saw Gerrera had a cybernetic leg and a pressure suit to support his damaged lungs. From the Legends continuity there are several other examples, many of which bear a significant resemblance to Vader's cybernetics. Other characters with armored life support systems include Lumiya, another dark Jedi who received cybernetic prostheses explicitly modeled after Vader's, Azlyn Rae, a force user who was forced against her will to wear a set of life-preserving armor after being mortally wounded, Hogrum Chalk, an armorer who created Azlyn Rae's suit and had similar life-saving cybernetics, and Vader's secret apprentice Galen Marek in the non-canon dark side ending of the game Star Wars: The Force Unleashed, who wore cybernetic Sith Stalker Armor. Face masks to help damaged respiratory systems also seemed to be extremely popular among dark lords of the Sith in the Legends continuity, as Darth Malgus, Darth Plagueis, and Darth Tenebrous all had some variety of cybernetic respirators, and Darth Malak had a prosthetic lower jaw. Another EU/Legends character: Empatojayos Brand was another Jedi who was severely injured (by radiation) and had to get a cyborg body. According to Wookieepedia, this happened between Episodes III and IV (after a space duel with Darth Vader), so this would have been after Vader got his suit. Also, for Darth Vader's armor specifically, it apparently wasn't standard-issue either, according to current canon. It was designed by the scientist Cylo, who appears in the Darth Vader Marvel comic series, and it was developed specifically for Vader's wounds. I am not sure if it counts as it is not as extensive as a suit but there is Breha Organa's pulmonodes. They replaced her heart and lungs after an accident during her Challenge of the Body, and in Leia: Princess of Alderaan we learn Breha did not seek to cover them with synthetic skin since it was a reminder she had survived. Is there anything like Star Trek's replicator technology in the Star Wars universe? Are there any technological limitations in the Star Wars universe? How many Walkers are there in Star Wars universe? Did anyone in the Star Wars universe wear effective armour? Are there any naming conventions for characters in Star Wars? Are human-like characters shown in star wars humans? Are there Nuclear Weapons in Star Wars universe? Are there Bounty Hunters in Star Wars universe who work within the limits of the laws?